testing what happens when I fill out the info box. hmm. testing what happens when I fill out the info box. hmm. testing what happens when I fill out the info box. hmm. testing what happens when I fill out the info box. hmm. testing what happens when I fill out the info box. hmm. testing what happens when I fill out the info box. hmm. testing what happens when I fill out the info box. hmm. testing what happens when I fill out the info box. hmm. Recently, I had the pleasure of attending a Bibi Graetz wine dinner at Franck’s restaurant, hosted by the chefs and owners of Franck’s and Tuscany, along with wine expert Marco Stevanoni. Stevanoni—who represents Italy’s Bibi Graetz wines in the United States—is a fascinating and talented guy. He came to the University of Utah from Italy as a competitive cross-country skier; when that career fizzled, he took up golf and became a pro on the PGA Tour. These days, he imports and represents Italian wineries, but it wouldn’t surprise me if he suddenly took up auto racing and became a Formula 1 champion for Ferrari. During a stupendously good dinner crafted by Franck’s and Tuscany chefs Adam Vickers, Robert Perkins and their culinary team, guests enjoyed four memorable dinner courses paired with five different Bibi Graetz wines. If you aren’t familiar with Graetz’s wines, such as the flagship Testamatta, you should rectify that. Graetz’s wines are remarkable—The Wine Advocate’s Antonio Galloni called Bibi Graetz “one of Italy’s finest growers.”—but the prices, mostly, aren’t. The evening began with seared scallops, citrus confit and spiced pistachios paired with a 2011 Casamatta Bianco ($11.99). Stevanoni explained that “casamatta” translates as “madhouse,” since apparently Bibi Graetz and his crew are all a little wack. The Vermentino-based blend, with its herbal notes and crisp acidity, was a good partner for the seared scallops. Next up was Casamatta Rosso ($11.99), which was partnered with luscious braised oxtail agnolotti bathed in a silky tomato-cream sauce and topped with crispy fried kale. Like its Bianco sibling, this is a delicious, but uncomplicated young wine, with plenty of fresh cherry flavor, light tannins and a firm, clean finish. The Casamatta wines from Bibi Graetz are, in my opinion, among the best wine values in the world. We next turned to 2008 Soffocone di Vincigliata IGT, Tuscany ($38.14), a blend of Sangiovese, Canaiolo and a smidgeon of Colorino (which, as its name implies, is added to the wine merely for color, according to Stevanoni). The somewhat racy label depicts a woman apparently in flagrante delicto, which seems appropriate for this lush, seductive, fleshy wine with a nearly creamy texture. It was beautiful, paired with an exquisite dish of rich roasted quail, exotic mushrooms and porcini barley. A final course of Duroc pork shank braised with red wine and bone marrow afforded us the opportunity to taste two vintages—2005 and 2007—of Bibi Graetz’s world-renowned Testamatta IGT, Tuscany. This was a very special treat given that the Testamatta wines retail for around $150 each. 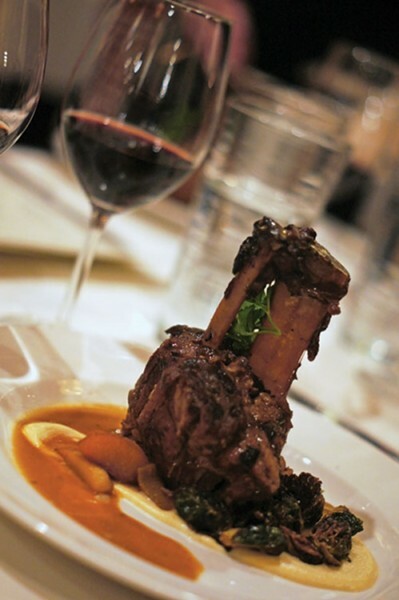 The 2007 vintage earned 95 points from Wine Spectator and was spectacular with the oh-so-tender pork shank. It’s simultaneously soft, yet complex and powerful, with prune, porcini and mocha flavors. Meanwhile, wine critic Robert Parker thought enough of the 2005 Testamatta vintage to give it 93 points. It’s a gorgeous, harmonious wine. The food, wine, service and company at Franck’s Bibi Graetz dinner could not have been more enjoyable—easily the best wine dinner I’ve attended in ages. Stay tuned for upcoming wine events at Franck’s and Tuscany.